Beekeepers, or apiarists as many of them refer to themselves (from the Latin api for bee), play an an increasingly important role supporting sustainable agriculture practices for American farmers. As declining bee populations worldwide put a strain on natural pollination, crop growth, and food yield, the people who raise and protect bee colonies are more vital than ever. You would think that with declining populations of bees, it would be easier for beekeepers to find more work for their hives. However, even with greater demand than ever before, not all beekeepers find it that simple to contract out their workers, and as farmers will tell you, it’s not always easy to find an apiarist to handle their pollination jobs. In today’s blog from the Pollination Network, we will discuss what you — as a beekeeper — can do to promote yourself effectively and find the jobs you are looking for. Read on to learn more or visit us online to download our free app. Just like any other small business owner, market research is a critical component of successfully earning new business and developing a thriving company. The United States is a massive country — the third largest in the world in terms of land mass — ranging from desert to alpine climates and covering almost everything in between. Different area of the nations from New England to the South to the West Coast all are home to different kinds of crops, soils, and pollination needs. By learning more about what the farmers, growers, and agriculturalists around you are planting and harvesting, you can keep ahead of the competition when it comes to being ready to take on new jobs effectively. Demand for beekeeping services may also vary depending on where you live and work, so make sure that you know what you and your bees are worth to those looking for your services. Again, just like any other business, you are engaging in a transactional relationship that has the potential to leave the purchasing party with buyer’s remorse if the experience isn’t a good one. From making sure that you are well organized, polite, helpful, and respond the professional inquiries in a timely manner (24 hours or less), and follow up with growers about how you can improve your offerings and their experience. Doing all of this can help you build relationships and develop a reputation as an elite and professional beekeeper, ultimately helping you to earn more jobs for you and your bees. In today’s world, the more than you can automate and digitize, the more efficient and effective you can be. This holds just as true for beekeepers as it does for any other small business owner. By hiring technologically savvy employees or organizations who can help with social media, digital record keeping, and digital marketing, you can improve your workflow and increase your visibility. We recommend that at the very least, you leverage the latest technology from the Pollination Network — our 100 percent free app, available on Google Play and in the Apple App Store. This revolutionary app allows you to connect with growers who are posting jobs that bees are needed for in your area. Just open the app, review the user-friendly and intuitive map listings, and apply to the opportunities that you believe you and your colony are a good fit for. You’ll be busy as a bee in no time. It really is that easy. 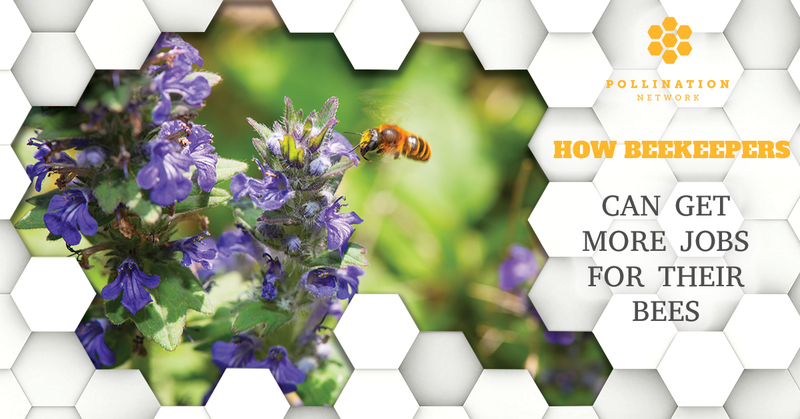 We invite you to visit our site to learn more about the Pollination Network, our free app, and how we are changing the way that apiarists and farmers work and connect. A more sustainable, profitable, easier way to do business, all while protecting the environment, is right around the corner.